Let’s talk about Frank Kaufmann. He told a marvelous story of being one of the insiders who knew everything about the Roswell UFO crash, retrieval and cover up. He talked from the first moment I interviewed him in 1990. He was cagey at the time, hinted that he knew quite a bit about the case, but was somewhat reluctant to talk about it. First question... how did I learn about Frank Kaufmann? Walter Haut told me that someone I would want to talk to was Frank. Walter hinted that Frank had some inside knowledge that would be helpful. I called Frank not long after Walter had given me his name. Frank told me (and several others) that he had been at the base in July 1947. He hinted then that he had been part of the military, but the truth was, he was assigned there in a civilian capacity. Frank said that when the war ended, he was not going to be released from the service because he was in a critical job. They decided that he could do it as a civilian and draw less attention to himself, so he was released from active duty in 1946. 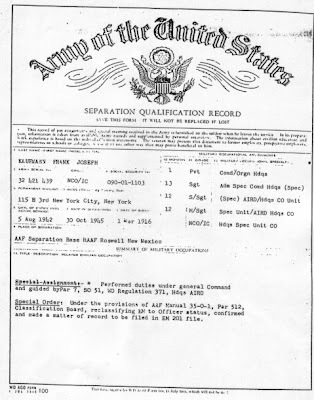 Frank provided a copy of his separation paper showing that he had been a master sergeant and that he had some very specialized intelligence training. The document looked to be authentic and in one sense was (seen above is the doctored version of Frank's separation papers). Frank’s picture appears in the Yearbook that Walter Haut put together in 1947. Frank is receiving a medal from Payne Jennings. Studying the picture carefully (seen here), I believe the medal to be a World War II Victory Medal, though I don’t know why there were be a presentation for it. Everyone who served in the military during WWII received it. 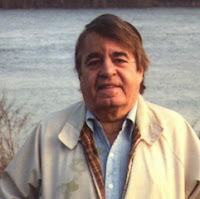 Those in Roswell I asked about Frank, including Walter Haut told me that he was honest and that, according to Walter, "Anything Frank tells you is golden." Each time we began to waver, each time we began to suggest that we were getting nowhere, Frank would come up with another bit of documentation. He provided notes, on authentic paper from the era (that is post WW II) that suggested they were old. Don Schmitt told me, based on his experience as an artist (yeah, I listened to that), that he thought the drawings were quite old (they would have been around fifty years old at the time) which suggested that Frank had made them in 1947. The paper was the kind used by the military during the war, and included the little "Buy War Bonds," logo. He gave me a copy of a page from the log book that documented the time of the crash, according to what Frank said. We talked to William Woody, a young man in Roswell in 1947, who told us of seeing the craft in the sky and Frank’s notes seemed to confirm what Woody said. Since the two didn’t know one another, there was no collusion between them. Later he would give me a letter signed by Edwin Easley, that said, "For the purpose of analysis and evaluation, the craft recovered is being assumed to be manned craft of unknown origin and may in fact represent an interplanetary craft of some kind." Yeah, this would be a smoking gun document, but it seems that a couple of the office symbols used didn’t exist in 1947. To Frank’s credit, he did spell marshal correctly, as in provost marshal. 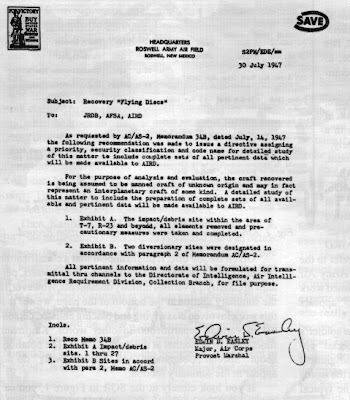 He provided a document dated 25 Sep 47 that begin in part, "In accordance with (which we would now write as IAW) directive from the Directorate of Intelligence, Air Intelligence Division... the following military/civilian personnel will adhere to the duties and responsibilities as outlined in AIRD Manual E723." Frank's name tops the list, as do the names of other members of "the nine" that Frank had identified. And was signed by Robert J. Thomas, Major, Air Corps. And Frank's name is at the top of the list. 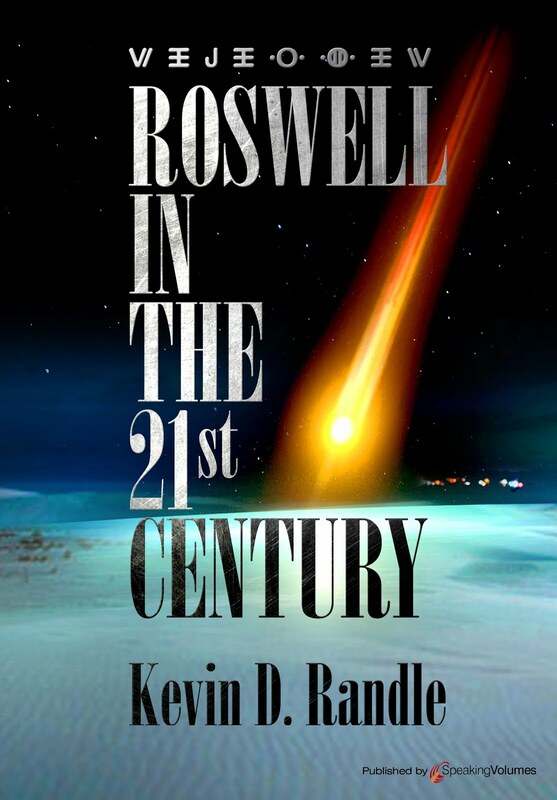 So, we had Walter Haut giving us Frank Kaufmann, we had some of the people in Roswell vouching for him as an honest man. We had some documentation that did prove some of what Frank was telling us... and quite frankly, as Karl Pflock pointed out, we had the will to believe. There wasn’t really much evidence to show that Frank was lying at the time some decided that he was. If you accepted the Mogul myth, as Karl did, then you knew that Frank was lying, but if you thought the crash might have been extraterrestrial, then Frank could be telling the truth. He would give us pictures and shows us documents and hint that other things would be given to us when the time was right. There were little confirmations. Frank said the craft fell late on the evening of July 4, and that worked out so that Woody and his dad went out looking for it on the weekend rather than on a Tuesday night and that seemed more logical. He said that he had met Werner von Braum and when we questioned that, he produced a "Congressional Recognition" which was an official document showing that von Braun had been in Roswell to help dedicate the museum about Robert Goodard. So, Frank, who was the Executive Vice President of the Roswell Chamber of Commerce was there. One paragraph said, "Frank Kaufmann... has, through the years, made a notable contribution. National leaders such as Dr. von Braun..."
Frank’s stories all unraveled right after he died in 2001. Dr. Mark Rodeghier of the Center for UFO Studies, with Mark Chesney and Don Schmitt were in Roswell and were asked by Kaufmann’s widow, a very nice lady named Juanita, if they would check his papers to make sure there were no obligations that he had failed to meet prior to his death. 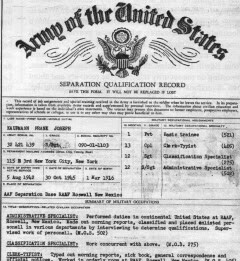 While searching those papers, they found the evidence that Frank had forged many of the documents, that he had a supply of the old paper, that he had been nothing more than a staff sergeant (which is not to say that staff sergeants aren’t important, only that he hadn’t been a master sergeant), that he had two old typewriters, and other bits and pieces. It meant that th Kaufmann tales were little more than the inventions of a clever man. So, to answer the question, how did he slip through? His name had been provided by Walter Haut, he was vouched for by Walter and others (such as Robert Shirkey, an operations officer at Roswell in 1947), and he had some documentation. For those interested, I had written to St. Louis in an attempt to get Frank’s record and was told, "If the record were (sic) here on July 12, 1973, it would have been in the area that suffered the most damage in the fire on that date and may have been destroyed." 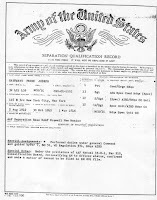 In another attempt, made in 2003, they provided no records other than to write, "This veteran was a member of the Army of the United States from August 5, 1942 to March 27, 1944. He was honorable discharged as a staff sergeant." This isn’t correct. According to Frank’s "real" separation, he was discharged on October 30, 1945. I don’t know why those in St. Louis reported the date as 1944. Needless to say, had this information been available to me ten years earlier, I could have avoided the embarrassment of believing that Frank Kaufmann had anything of value to contribute to the investigation. I don’t know how we go about preventing this in today’s world. Yes, we should be more skeptical and yes, we should check out as much as we can. Independent documentation is necessary, and it is good to have someone vouch for the witness. But Frank had the documentation. The verification of his military service simply didn’t work and I don’t know why. The Records Center in St. Louis should have been able to do something more than say the records burned and later providing inaccurate information. Frank appeared to be who he said he was. He was clearly in Roswell at the right time and he clearly had been assigned to the base. We had documentation, we had others vouching for him. The only thing we could have done is not report his story, but then where would we be. We’ve all been fooled. Some by Gerald Anderson who seemed to be credible but was not. Glenn Dennis who told a marvelous tale with a missing nurse, only to change the name, and the conditions when it was found there had been no nurse by that name. 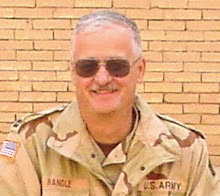 Jim Ragsdale told of seeing the crash and seemed to have some inside knowledge that, at one time, corroborated part of Frank’s story, but later blew up just as badly. I suppose all we can do is look at the tales with a skeptical eye, search for verification and report the facts as we learn them. Otherwise we’ll just never get anything done. I will point out one other sad fact here. As we, meaning Don Schmitt and I were working on this investigation, there were many who wondered where our financing originated. They thought MUFON, the Center or FUFOR was providing it. Both the Center and FUFOR did contribute, but nowhere near the amount we needed. It came from our own pockets and one of the ways to recover some of that money was to publish what we had. Yes, it was premature and preliminary, but it was also necessary so that we could continue. We went with the best we had. Unfortunately, at this point, people were coming out of the woodwork with great stories of the crash. I mean, it was great to begin a lecture by saying, "This story starts like those Science Fiction tales in the movies... a couple in a desert area and something falls from the sky..."
I really have no solution for this problem of financing. I’ll also note that some aspects of the UFO field are revisited periodically because there are those who believe it with a passion. We have contactees, cattle mutilations (yes, I’ll stir up that hornets nest again) the Allende Letters and so on, all coming back so that we don’t progress. We do the same things over and over and don’t progress at all. We stagnate and never realize it. Back a decade or more, I was collecting video-taped testimony from Roswell witnesses for the Fund for UFO Research’s oral history project. I was in California with Stan Friedman and we, quite naturally, began to discuss MJ-12. I had heard from a couple of people that Bill Moore, one of those who released the MJ-12 documents into the public arena in 1987, had been talking about creating a "Roswell" document to try to shake things loose. Friedman confirmed that it was true. Bill Moore had told him the same thing. But when the MJ-12 documents surfaced, Frriedman thought nothing of that conversation and the fact that the documents had not gone to Moore but to an unknown film producer whose only tie to the UFO community seemed to be Bill Moore. 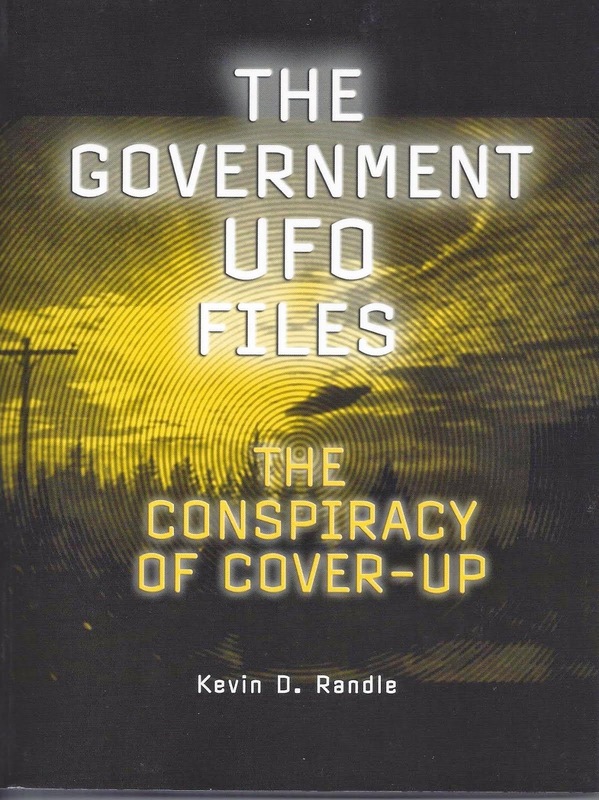 Barry Greenwood had heard the same thing and reported in his Just Cause newsletter of September 1989, on page 10, "After Moore released the first wave of MJ-12 documents in 1987, CAUS [Citizens Against UFO Secrecy], and particularly Larry Fawcett, spoke to Moore about cooperation in researching the story in the form of filing FOIA requests, etc. as an effort to flesh out information. 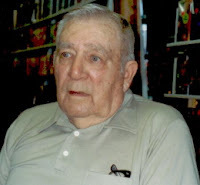 Moore rejected the offer, adding that he wanted to ‘put bread on my table.’"
In the late 1980s, as I was beginning my research into the Roswell case, Warren Smith (seen here), a writer living in Clint on, Iowa called me and said that he had just learned of MJ-12. I believe he had a copy of the MUFON Journal that had an article about MJ-12. Smith told me that he knew something more about the Del Rio crash of 1950, which was mentioned as part of the Eisenhower Briefing paper dated November 18, 1952 and was the major piece of MJ-12 documentation available at that time. Smith’s story was that he had been installing and upgrading linotype machines somewhere and one of the men he worked with had a wife who was visiting a "dude" ranch in southern Texas. The man was getting daily letters from his wife. They took a weird slant when she mentioned that the cowboys had seen something strange crash and that the military had come in to recover it. If this story was true, then it would be a nice piece of corroboration for the Eisenhower Briefing document. Smith said that he could get the letters, but never did. Later I learned that Smith had a habit of inventing things like this (He once tried to interest a friend in creating the Ted Bundy diaries). I couldn’t trust anything he had said and it meant that this corroboration did not exist. 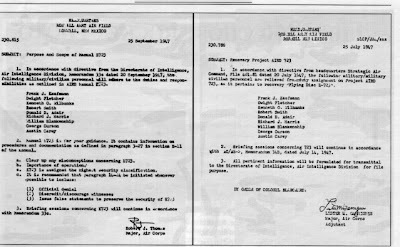 There were other, major problems with all the MJ-12 documents as well. 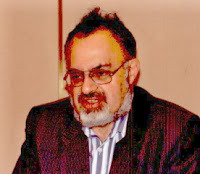 Stan Friedman sent copies to a questioned document expert, Peter Tytell. Tytell analyzed them and concluded they were faked. He pointed to the signature on the Truman Memo which was part of the Eisenhower Briefing and said that it was uncharacteristically low on the page. Truman habitually signed with the top of the "T" on Truman reaching into and touching the text of the letter. That it did not on the memo in and of itself didn’t prove it was faked but it sure suggested it. The proof was on the "T" on Truman. According to Tytell, there was evidence that the top stroke on the "T" had been altered. That was definitive proof that the memo was a fake. And, if that wasn’t enough, the signature on the memo matched, exactly, another signature on an authentic document. To Tytell, as well as other experts, this exact match proved the document to be faked. Tytell also said that the typeface on the documents was from a typewriter that didn’t exist at the time the document was supposedly written. To him it was another proof that these documents were faked. Yes, I know that Friedman has said that other experts said the typewriter did exist, but he has offered no proof of this and has not identified these experts. Yes, I know that Robert and Ryan Wood have found pictures of Truman using an automatic writer so they suggest the exact match isn’t a disqualification on the Truman Memo, but frankly, they’d need to find a third document to show that Truman used it to sign the memo, and they have not. And yes, I know Friedman (seen here) has little to say about Tytell and demands we produce a signed assessment by Tytell knowing full well that Tytell refuses to do so until someone pays his fee. If I had a couple of grand laying around, I’d do it myself. Well, that was '53... fully 11 months after the Robertson Panel, and there were all sorts of doings and goings on between the CIA and the NSC where the CIA was attempting to - it's not clear which way it was going, whether the NSC was attempting to get the CIA to take over things or whether it was vice versa. I've never been quite clear, on who was trying to influence whom, but if you read that message it is very confusing. And especially when a lot of those documents make reference to attachments which aren't there. So I have just sort of conjectured that the NSC got control of it at the point in time where Truman was ending his administration and Eisenhower was beginning his. If you stop and think about the point in time of the Robertson Panel, it happened just on that transition phase. See, Truman had not run for reelection in '52, in November. Eisenhower wins and takes office in January, January 20, and you've got the Robertson Panel deliberating in there, and it could .well be that somebody was trying to determine how to go on with the change in administrations, which would have presented a problem for that sort of a thing, especially if it had gotten highly developed and the decision had already been made that this has got to be kept locked tighter than a drum. How then to deal with it with an incoming president whose reaction is not certain. And that's a point that nobody's ever brought up that I've heard in discussion. Nobody's ever noticed that that date is a very interesting. And one of the biggest problems for these documents is that there is no provenance for them. The trail leads to Bill Moore and Jaime Shandera and ends there. No authentic documents mentioning MJ-12 has ever been found. None of the men mentioned left personal papers that contained a reference to MJ-12 and that suggests there are none because lots of people have spent lots of time looking for just that sort of a reference. The final and probably fatal blow to all this is the paper Brad Sparks delivered at the most recent MUFON conference. 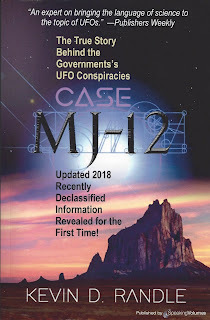 In it Brad traces the history of MJ-12, in its first incarnation as a novel to be written by Bill Moore, a Air Force OSI agent named Richard Doty, and former National Enquirer UFO reporter Bob Pratt. Quite a bit of the MJ-12 stuff surfaces in that novel. And yes, I know the excuse will be that they thought a novel was the best way to publish the information about MJ-12. A nonfiction book would have required sources and footnotes and evidence, something they didn’t want to have to produce. And, more importantly, after all these years, have failed to produce. 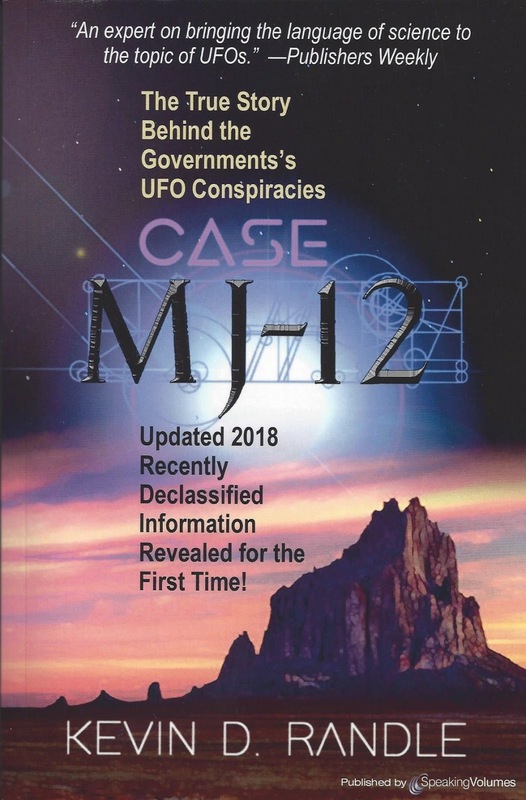 Using the information from Pratt’s personal notes ( a sample of which was quoted earlier), interviews with various researchers, Sparks, along with Barry Greenwood, conclude that MJ-12 is a hoax. Sparks believes it was a sanctioned disinformation campaign by the AFOSI with Moore and Shandera as the willing participants, or maybe the unwilling dupes. The evidence leads clearly to hoax regardless of the spin put on it or the reason for its creation. Sparks points out that this report is the most heavily footnoted article to ever appear in The MUFON Symposium Proceedings. It contains facsimiles of many of the documents and it outlines the evidence clearly and concisely. It should drive the final stake through the heart of MJ-12, but nothing in UFO research ever sinks completely. There are always those who will attempt to resurrect it by claiming that was a disinformation campaign that contains some "real" information. All we have to do is figure what is real and what is fake. But disinformation implies that it was an official operation of some kind and in this case the overseeing agency is AFOSI, at least to Spark’s way of thinking. I’m not sure it was a sanctioned mission and it might have been more of Doty seeing a gravy train and leaping aboard with his buddy Bill Moore than it was any kind of planned AFOSI operation. At this point, it really doesn’t matter because in either case, the conclusion of hoax is the important one. Government disinformation or opportunism by Doty and Moore makes no difference in the end. They both lead to hoax. *I believe the attempt failed because those running the cover up were smart enough to realize that the document had nothing to do with reality and that it contained information that was just flat out wrong. It didn’t conform to the standards of the time and date used by the military, contained misspellings and it contained nothing extraordinary. It did, however, interest the media for a while, but they quickly gave up when they could find no corroboration for the document and that many of the mistakes were noticed. In the end, MJ-12 has damaged th hunt for the truth.